Ranger Creek is hosting another Live & Dine on April 28th from 5:00 p.m. – 9:30 p.m. The Live & Dine will feature a full menu of appetizers, main course, side dishes, dessert and live entertainment. 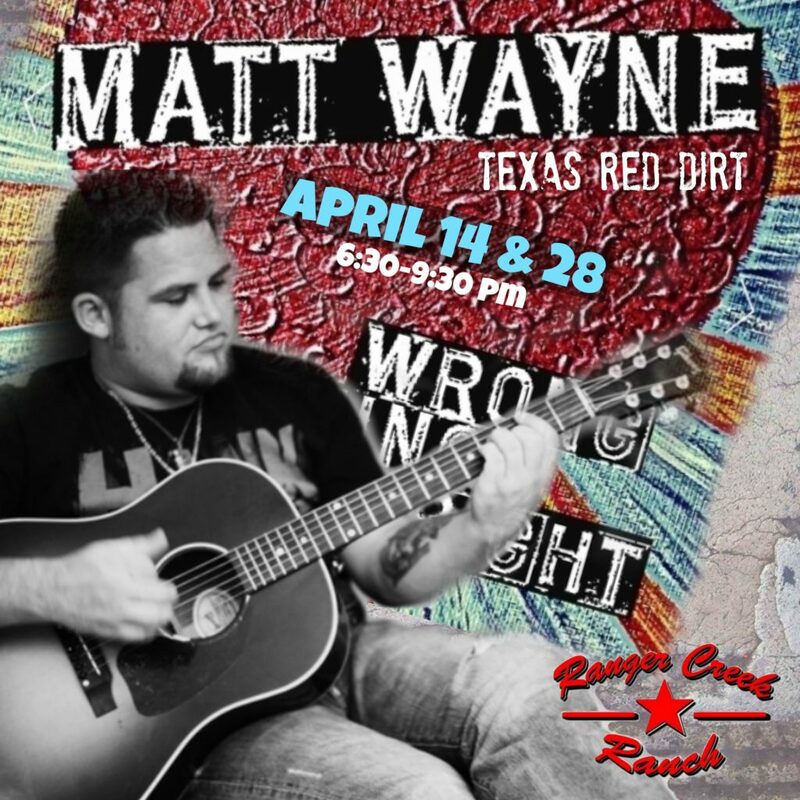 Matt Wayne is a country artist from the Fort Worth area. He has a red dirt style to his music and tone. His voice is truly amazing for this genre. He was a huge hit for the April 14th event. His knowledge of country music was vast and the crowd enjoyed him. Hors d’oeuvres begin at 5:00 p.m.
Dinner will be served from 5:30 – 7:30 p.m.
Matt Wayne will play from 6:30 – 9:30 p.m.
Come and hang out and enjoy the ranch. Rocking chairs and outdoor games provided for your enjoyment. There will be indoor and outdoor seating. Please RSVP so we know you are coming. 940-256-3464 text or call or 940-888-2478 or email at ranger@rangercreekranch.com .